CARLISLE, Pa. — GIANT Food Stores announced that it has agreed to acquire five corporately-owned Stop ‘n Save stores from Supervalu Inc. The stores will be converted to the Martin’s banner once the deal is compete. GIANT president Nicholas Bertram in front of a Martin’s store. “This acquisition demonstrates our continued commitment to the long-term growth strategy we announced earlier this year,” said GIANT Food president Nicholas Bertram. 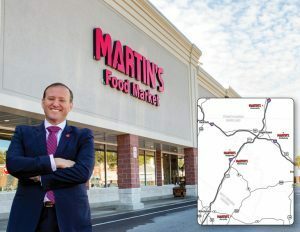 “Our Martin’s associates have proudly served many of these communities for years, and we look forward to expanding the MARTIN’S brand along the Interstate 81 Corridor and within the Eastern Panhandle of West Virginia.”Supervalu, now a subsidiary of United Natural Foods Inc., has said it plans to exit the retail grocery business. 22401 Jefferson Boulevard, Smithsburg, Md. 147 Roaring Lion Drive, Hedgesville, W.Va.
1317 Old Courthouse Square, Martinsburg, W.Va.
Current Shop ‘n Save employees at these stores will have the opportunity to interview with Martin’s, according to GIANT, which is a division of Ahold Delhaize USA. The sale is currently expected to close during the first quarter of 2019, subject to customary closing conditions. The sale must also be notified to and receive approval of the Federal Trade Commission pursuant to the Decision and Order issued In the Matter of Koninklijke Ahold N.V. and Delhaize Group NV/SA, dated October 14, 2016. Carlise, Pa.-based GIANT, which is celebrating its 95th anniversary this year, currently has 171 stores in four states, which operate under the GIANT Food Stores and Martin’s Food Markets banners.